ASUS have made a good name for themselves when it comes to creating devices with dual functionality. It was just last week at MWC where the company unveiled the FonePad which is a first of a kind tablet which can make phone calls. Today the Taiwanese Tech giants have unveiled another work of marvel with the launch of the ASUS Transformer AiO. The device which measures close to 18 inches is not just your ordinary Tablet which you can carry around everywhere. What it is actually is a dual booting Hybrid Entertainment Center which runs on both Android and Microsoft’s Windows 8 Operating System. Confused ? Surprised ? Well to be very honest we were too when we first laid our eyes on this little monster. Now coming to the interesting side of things. Let us begin with the hardware which this little piece of marvel has to offer. The tablet is actually a 2 in 1 computing machine which when detached from its docking station, turns into a full fledged Tablet and while it is docked, it actually functions as a full juiced up PC. 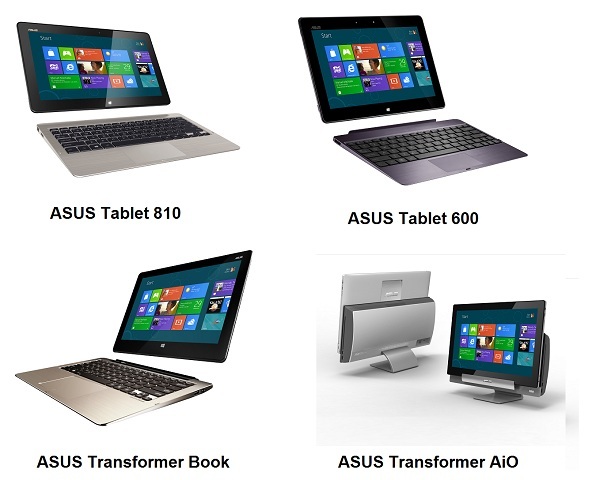 The hardware which differs for both the Tablet and the PC is divided into two parts. The tablet (when not docked) which runs on Android 4.1 Jellybean comes juiced up with an Nvidia Tegra 3 processing chip, 2GB RAM and 32 GB of internal storage. Impressed ? Now wait till you read further and find out as to exactly what ASUS have in store for us on the PC side of things. Well to begin with, the device does come to life on its large and bright 18 inch 1920×1080 LED display, which currently makes the AiO the largest commercial Android tablet (at least for now). As mentioned earlier, the Windows 8 powered device (it doesn’t sound right to call an 18 inch device a TABLET does it?) surely packs a punch. It comes bundled with a a third-generation Intel Core i5-3350P CPU, 8GB DDR3 RAM and 1TB of storage. Sounds intriguing doesn’t it ? To be very honest, we were a little perplexed to see Windows 8 and Android side-by-side on this kind of device, not least due to Microsoft’s keenness to promote Windows’ tablet credentials. But ASUS is also touting the AiO’s ability to run Windows 8 in remote desktop mode on the tablet UI, so you’ll have that option open to you while you’re in tablet mode and that is quite a smart move on ASUS’s part. The Trasnformer AiO which is scheduled to release sometime during the second quarter of 2013 in North America is rumored to be priced at around $1299. We’ll be on high alert once the device hits markets. Till then, let us all just keep wondering as to what the future has in store for us next ?